Variety: Common names include Star Jasmine and Confederate Jasmine. 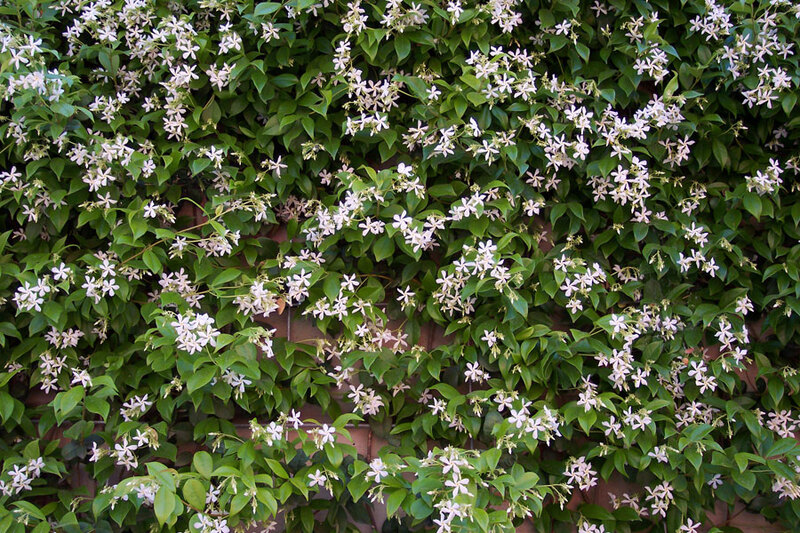 Note: Star jasmine is a woody, evergreen climber with rich, dark green leaves which (may) turn bronze in winter. 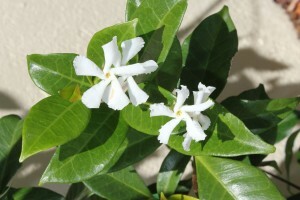 From mid to late summer, pure white, fragrant flowers are produced. 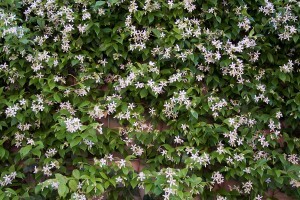 It can be grown against a wall in milder climates or in a greenhouse or conservatory in areas prone to severe frosts. Grow in well-drained soil in full sun or partial shade with protection from cold, drying winds. If growing indoors, plant in loam-based potting compost in full light but not direct sun. Water freely and apply a balanced liquid fertiliser monthly during the growing season, and water sparingly in winter. Fruit / flower: The small, fragrant flowers are white, 1–2 cm in diameter, with a tube-like corolla opening out into five petal-like lobes. The fruit is a slender follicle 10-25 cm long and 3-10 mm broad, containing numerous seeds. Colour: The flowers are white. Flowering time: Spring through summer. Flower size: 1-2 cm in diameter. 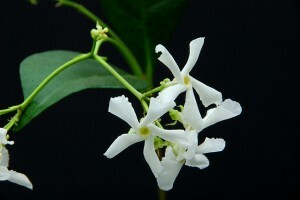 Fragrance: Sweet, jasmine like fragrance. Light preference: Full sun or semi shade. Shade from direct sunlight may be needed in some situations to protect the leaves from sun scorch (leaves may turn bright red). Fertilisation: Fertilise with a general fertiliser in spring. Does well with a compost top dressing. Pruning: Maintenance pruning is done is spring, and consists simply of thinning out congested, weak or badly placed shoots. Wayward branches can be tied back to their supports to improve the shape of the plant. If your Star Jasmine has spindly stems without many growth buds, you can shorten the main stems by about one-third, to encourage vigour and bushing out. 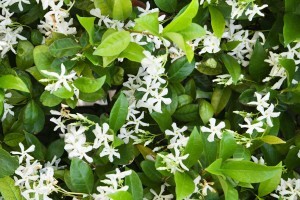 Propogation: Star jasmine can be propagated by layering in spring, and also from semi-ripe cuttings in summer and autumn. References: Wikidepia, RHS and Floridata.